Samsung is not just about smartphones, and the Korean company has proven it once again by coming up with the world’s largest SSD (solid state drive). On Tuesday, the company announced that it has started with the production of the 30.72 Terabyte (TB) solid state drive – the most storage ever in a 2.5-inch form factor – called the PM1643. Samsung’s PM1643 is not a consumer-focused device. Rather, it will be used in future storage systems in health care, education sectors, financial services, social media, government, retail and communications sectors. To give some idea of the storage capacity of the world’s largest SSD – it can store about 5,700 full HD movies, or the equivilant of 120 iPhones of 256GB (the biggest so far), or about 500 days of non-stop video. Further, it is twice the capacity of the former largest SSD – Samsung’s 15.36TB drive, which was released in March 2016. 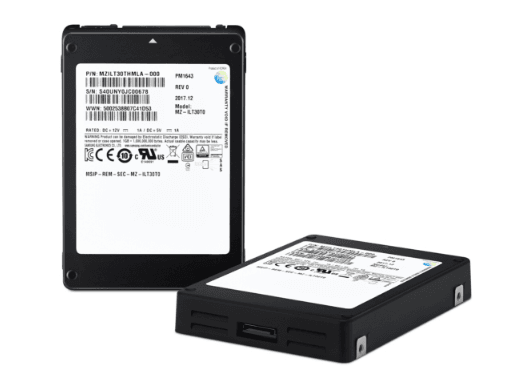 Samsung credits a 30TB capacity drive to several advancements. One such advancement is the highly efficient controller architecture, which made it possible to include nine controllers from previous drives in a single package. Further, the drive is also equipped with 40GB of DRAM, all thanks to TSV (Through Silicon Via). TSV, which supports the integration of 8Gb DDR4 chips, helped in including 10 4GB TSV DRAM packages in the drive. “This marks the first time that TSV-applied DRAM has been used in an SSD,” Samsung says. According to the Korean company, it combined layers of flash memory into “super-dense” 1TB packages to come up with this mammoth SSD. Further, this 2.5-inch solid-state drive comes with a Serial Attached SCSI (SAS) interface. The SSD uses Samsung’s latest 64-layer 3-bit 512-gigabit chips and 32 1TB NAND flash packages. The PM1643 will come with sequential read and write speeds of up to 2,100MBps and 1,700MBps, respectively. In comparison, it is three times faster than Samsung’s consumer-level 860 Evo and Pro models, according to CNET. Also, when compared to a typical 2.5-inch SATA SSD, the PM1643 is three-times the write speed and four-times the read speed, Samsung claims. Along with being big and fast, the world’s largest SSD is robust as well. The Korean company is promising a five-year warranty. Further, according to Samsung, this SSD offers a MTBF (mean time between failures) of two million hours. To accelerate the transition in the enterprise market from HDDs (hard disk drives) to SSDs, the Korean firm plans to come up with 15.36TB, 7.68TB, 3.84TB, 1.92TB, 960GB and 800GB versions as well. “Samsung will continue to move aggressively in meeting the shifting demand toward SSDs over 10TB,” said Jaesoo Han. As of now, there is no information of when the world’s largest SSD will go on sale, or how much will it cost. To give some hint of the price, Samsung’s latest 4TB 860 Pro SSD, which was released in January, came with a price tag of $1900.